Hello and welcome to YUKIMONO! 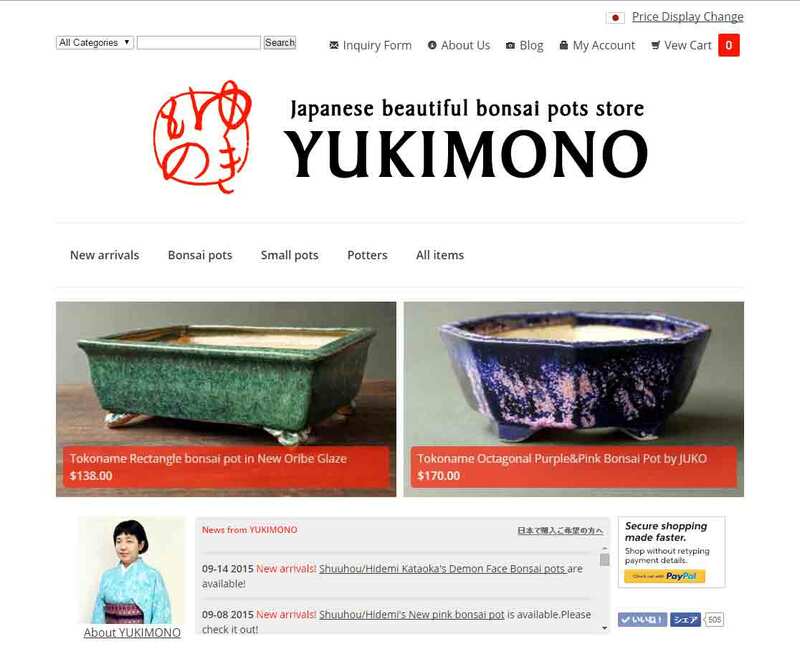 YUKIMONO is a Tokyo-based online store offering beautiful bonsai pots to bonsai fans and lovers of gardening. My name is Yukiko Kasai, and my nickname is Yuki. I would like to tell you why I started up this store. I love bonsai and other plants in small and attractive pots. Captivated by bonsai’s microcosmic world of trees and grasses, I began growing bonsai on my own six years ago. Today, I have 50 to 60 bonsai plants on shelves in my garden. Bonsai offers a variety of charms. What I like in particular is that everyone can create a beautiful work of art by putting a plant in an attractive pot. Placed in a beautiful pot, wild grasses or flower growing in a small corner of the garden can be transformed into a wonderful piece of art that adds a touch to the room and gives pleasure to the onlooker. What is more, a pot fashioned by a ceramic artist who has outstanding aesthetic acumen and skill will bring out the harmony with the plant. My love for bonsai pots grew with this realization. What plant should I place in this small hexagonal pot? Will apricot match the turquoise pot with its fleeting clouds? Becoming engrossed in ruminating on possible combinations between plant and pot brings me great happiness. Since becoming a fan of bonsai pots, I began to frequent regions of Japan that are well-known as birthplaces of ceramic ware. One such place is Tokoname in Aichi Prefecture, known for its tradition of making high-quality bonsai pots. After meeting bonsai pot manufacturers and craftsmen, I learned that more skill is involved in making these pots compared to tableware. To serve as a receptacle where a plant can grow, the pot must have excellent permeability and drainage and be durable, not too heavy and resistant to cracks in the cold of winter. It must also be made to match the plant. On top of all these comes the beauty of the pot. However, it is not enough just for the pot to look attractive. What is most important is a beautiful pot that harmonizes with the plant. Japan has many wonderful bonsai pots that meet these requirements. And there are many artisans who possess the necessary skill and artistic acuity. Bonsai art is gaining in global popularity today. The number of bonsai aficionados around the world is estimated at around 10 million now and is continue to grow each year. The number of gardening lovers must be many times more. I am hoping to introduce outstandingly beautiful bonsai pots from Japan to people around the world and show the joy of creating your own work of art through matching plant and pot. Of course, there are many skilled craftsmen around the world creating bonsai pots. I hope to present their work to the people of Japan and eventually to the world at large and spread the love of gardening through pots. This store was established as the first step. Thank you for reading my story and I hope you enjoy browsing the many items of beauty in the store.